Tomato season is in full swing now. I look forward to it every year. Tomatoes so ripe, you could eat them like an apple – juice gushing down your chin. They are sweet, a little acidic, and just plain delicious. I love them in sandwiches (with bacon – but this is a meatless monday post! ), roasted for soups, cut up into a salad, and even made into a terrine. But my absolute favorite way to eat these treasures of late summer are in a gazpacho. Ice cold and refreshing, there is nothing better when the heat is getting up to 100 degrees. It’s not even hard – you can make it a few days in advance, stash it in the fridge, and pour some whenever you’re hungry. The sun gold tomatoes we are getting from our CSA are absolutely amazing. They are small, yellow and have a lovely acidity to them. And their texture is unmatched – these little tomatoes just burst in your mouth when you eat them. I almost picked up my entire CSA load of tomatoes (close to 4 lbs) by gathering these sun golds! They are THAT good. The soup only requires you to put everything in a blender – it’s really as easy as that. But if you want an exquisite gazpacho, follow the steps below. I strained the initial puree of tomatoes, cucumber, garlic, onion, and red bell pepper to get rid of all the tomato skins. Then, I put it back in the blender and slowly added oil, almost like making a vinaigrette. 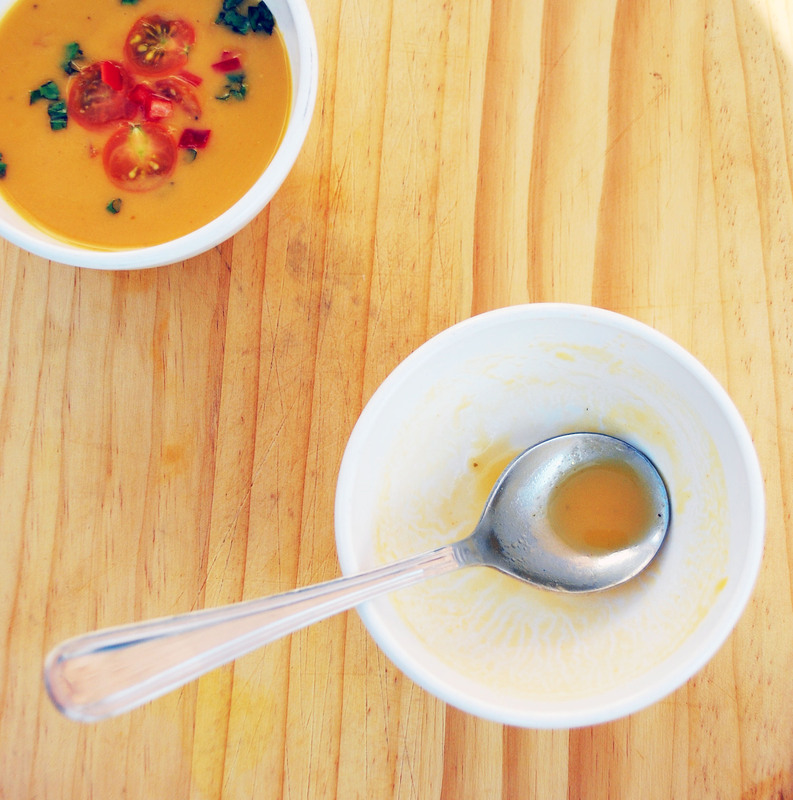 This emulsion of oil makes the texture of the soup so velvety and ethereal. It’s truly a joy to eat. And while we enjoy the bounty of the season, just sit back and relax, instead of spending time inside a hot kitchen. Go outside and enjoy the evenings that are finally getting cooler. Take a sip of that luscious gazpacho. And keep another bowl nearby, because when you finish, you’ll definitely be digging in for seconds. Pour water into a large bowl and add the onion and garlic. Reserve 1 cup of tomatoes for garnish, and add the remaining tomatoes and their juices to the bowl. Peel the cucumber and cut lengthwise in half. Scoop out the seeds with a spoon and cut 1/2 the cucumber into half circles. Add that to the tomatoes. Cut the other half of the cucumber into a small dice, and reserve for garnish. Add the yellow bell pepper to the tomato mixture. Core, seed, and finely dice the red bell pepper for garnish. Refrigerate the vegetables and the separate garnishes until ready to make. Transfer the vegetables with the marinade/water to a blender and start pureeing until smooth. (If you want, you can add the oil know and be done with the soup). If you want the best texture ever (and why wouldn’t you? ), then strain this puree through a sieve and get rid of the tomato skins. Rinse our your blender and return the strained puree to it. Add the vinegar and Espelette pepper. Season with salt and white pepper to taste and then blend to combine. 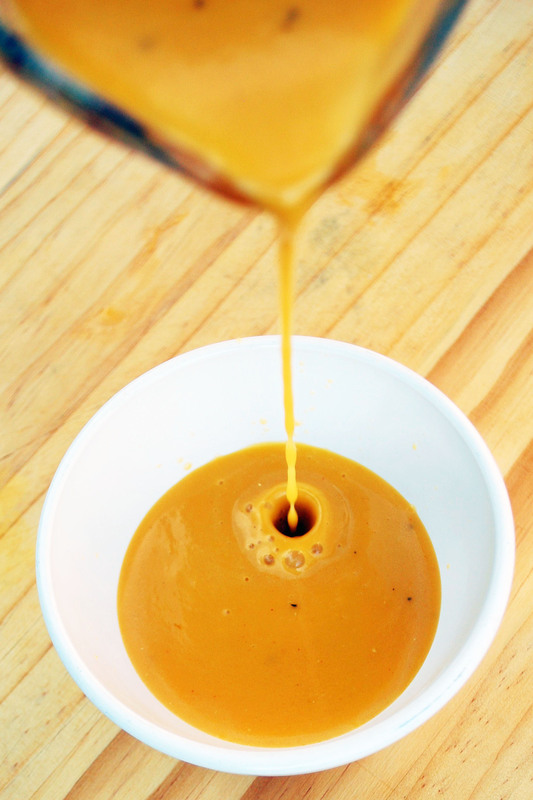 Slowly add the olive oil, blending until the gazpacho has a rich, velvety texture. Taste and re-season accordingly. Refrigerate the gazpacho until cold, or for up to 2 days. If the gazpacho has separated, just throw it back in the blender or whisk it up until combined again. 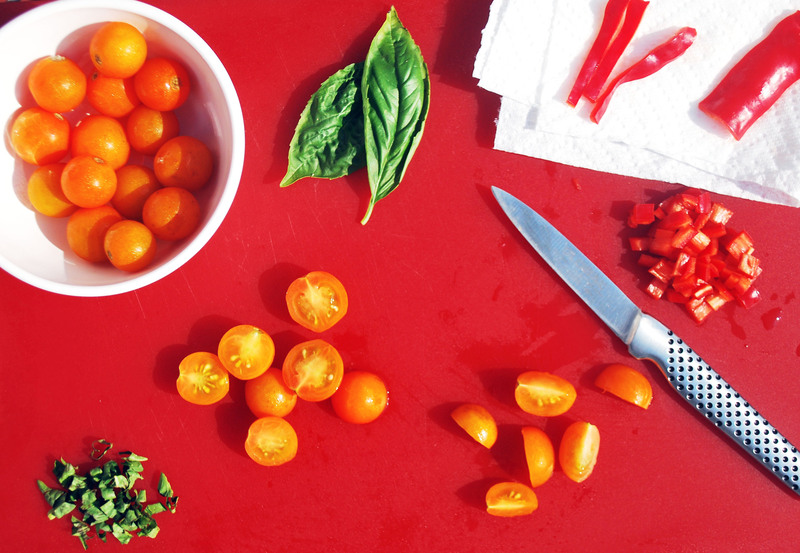 Pour into bowls and garnish with the tomato halves, cucumber, red bell pepper, and basil. Enjoy! ← It’s a Tomato (Pizza) Pie! I have never had gazpacho but your pictures make it look mouth-watering! After reading this Mom’s Guide to Caring for Little Teeth (http://www.1dental.com/moms-guide/), I started taking inventory of what I feed my son – mostly sugar and processed food – and decided I needed to make some changes. This looks like a great, cool summer recipe. Thanks for posting! Delicious. You don’t need further explanation. So get your big body of the couch and make yourself a gazpacho. Thank you! The color of the soup really is stunning! 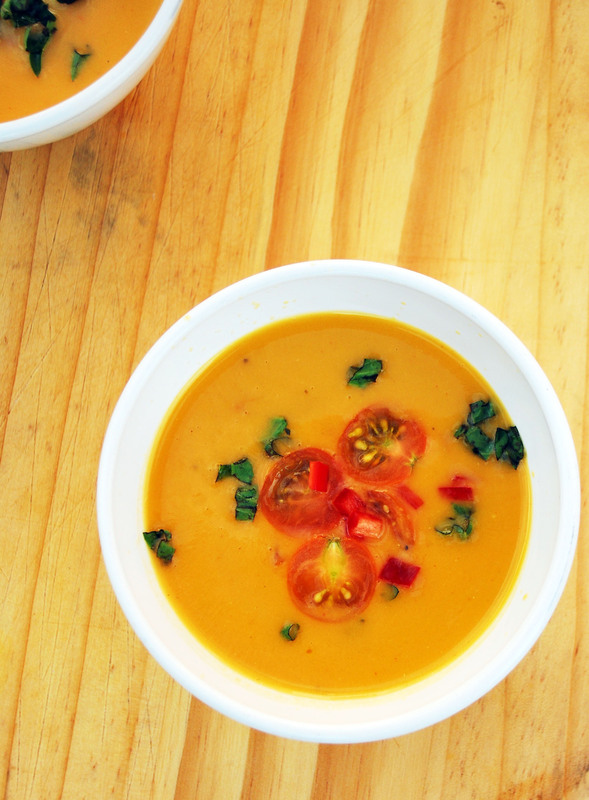 Wow, those Sungold tomatoes really make a beautiful gazpacho! Agreed – I wish it could last forever! Sadly, sun golds are already out of season, I think. The farm manager of my CSA told me this week was their last. Yes, I did make it myself! looks just lovely! gazpacho is one of my favorite summer soups, especially with tomatoes right from our garden. yum! Couldn’t agree with you more! Do you have those lovely yellow cherry tomatoes at your house? I’ll definitely try this recipe. What’s your go-to method to choosing great tomatoes? Do you have to memorize all the attributes of different varieties to know what you want at the farmers market, or is there an easier way? Sometimes it feels like a total gamble.